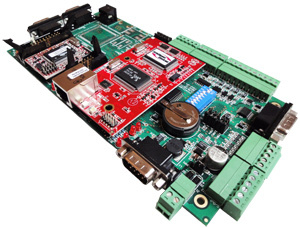 The DTI 1600 is one of a family of low-cost controllers that make the perfect engine to control signs, traffic count systems, weather stations, cameras or any custom applications where NTCIP communication and a keyboard/LCD interface is required. Five serial ports are provided (2 ports jumper selectable to be RS232 or RS485). An Ethernet port provides a powerful optional connection for high speed communication. The DTI 1620 incorporates a “flash disk” (16 MB standard) for storage of any graphical data or other information. This makes it a perfect choice for applications where large capacity on-board data storage is required. The powerful parallel processor architecture makes the implementation of custom menus easy. The NTCIP application runs in the first processor (as an NTCIP server), and the menus run completely independently in the second (as an NTCIP client). The two processors are connected via a high speed parallel bus. Custom menus can then be implemented without making ANY changes to the standard NTCIP engine. 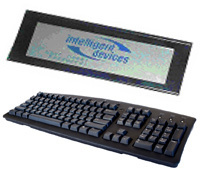 Keyboard and LCD Accepts standard PS/2 keyboard and 4×40 backlit LCD.